Events Lodge and 9 eco-friendly vacation cottages overlook lake in the Blue Ridge Mountains of Virginia, 15 miles NW of Charlottesville, and 40 minutes from Jefferson's Monticello. Explore 129 acres of hiking trails, mountain bikes, canoe, fishing. Pets welcome! 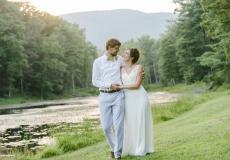 Events Lodge for weddings, private events, retreats, meetings, workshops and reunions. Description Montfair’s Lodge is a versatile space and large recreational hall with air conditioning, Wi-Fi, a spacious kitchenette, large wrap around deck and large fireplace overlooking a small lake with mountain views. 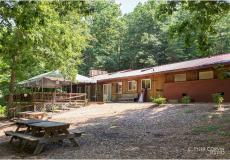 129 acres of hiking trails with mountain bikes, canoes, corn hole, volleyball, and fishing. 8 Eco- friendly vacation cabins are just across the lake with in easy walking distance. Space Notes The lodge is available for workshops, classes, reunions, meetings, lectures, weddings & receptions, family reunions, company picnics, retreats, BBQ's! Bonfires, hayrides, ponyrides and horsedrawn carriages can be arranged. 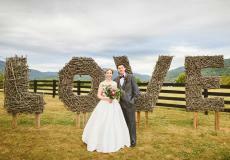 Weekday Wedding Packages in the Heart of Virginia's Blue Ridge!